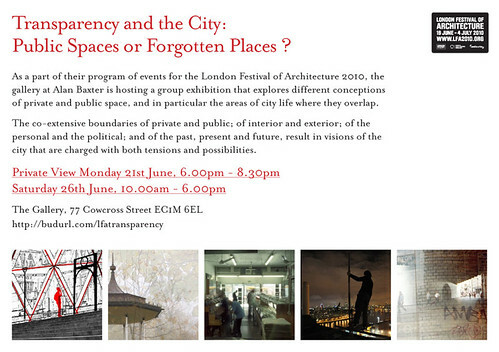 After some time away I'm very pleased to invite you all to join me at my group exhibition Transparency and the City: Public Spaces or Forgotten Places? Alongside my own collaboration with Mark from Dancing Eye, we will also be displaying a considerable number of works by other artists and photographers. Works depicting the incompleteness and fragmentation of a city undergoing change are joined by pieces demonstrating the highly personal and complex attachments that inhabitants develop for specific sites within the city. Featured works include: Jon Spencer's excellent Bandstands and Polyptychs; Christina Gestra's disorienting yet beautiful multiple exposures; and a sample of Hwei Fan Liang's loving pinhole snapshots of Berwick Street accompanied by an axonometric survey of the same location. The viewer should find much of this work to have psychogeographical import. We are also extremely pleased to be hosting a second collaborative exhibit entitled Urban Exploration // Behind the Scene. Given the fringe status of Urban Exploration as a liminal activity that regularly flirts with transgression, it is extremely rare to see these amazing images displayed in public. On the opening night we will also be screening an excellent documentary film on the subject created by blogger and academic Bradley L. Garrett. Jointly the works presented here serve as a challenge to any planners and architectural practices who too quickly reduce the question urbanism to that of product. Unlike many of the other exhibitions in the London Festival of Architecture 2010, this exhibition does not shy away from engaging with issues relating to what the French urbanist and philosopher Henri Lefevre first referred to as 'Right to the City'. Neither a natural right nor a 'simple visiting right' this is a 'transformed and renewed right to urban life'. Secured through practice alone, the 'cry and demand' expressed through the exercise of that right can only be answered by a city in which use value predominates over exchange value; where the interests of the cities inhabitants predominate over those of the property market. This exhibition forms part of the London Festival of Architecture 2010 and is being hosted by the gallery at Alan Baxter from Monday 21st June to Friday 2nd of July. Looking forward to seeing you there.